President Trump is going along with NATO chief Jens Stoltenberg on the alliance's increased deployment in Eastern Europe to supposedly deter Russia, but it will only reduce European security, Martin Sieff of the Global Policy Institute told RT. US President Donald Trump on Wednesday had his first face-to-face meeting with NATO Secretary General Jens Stoltenberg in Washington DC. However, his stance on having peaceful relations with Russia also stays in place, and Stoltenberg supported it. “It would be wonderful, as we were discussing just a little while ago if NATO and our country could get along with Russia. Right now, we’re not getting along with Russia at all. We may be at an all-time low in terms of a relationship with Russia. This has built over a long period of time. But we’re going to see what happens. Putin is the leader of Russia. Russia is a strong country. We’re a very, very strong country. We’re going to see how that all works out,” Trump said. Former CIA analyst Elizabeth Murray shared her thoughts with RT on President Trump's change of tune on NATO. “That seems to be in line with a lot of contradictory messages that have been coming from the White House. It seems like just over a week ago we heard that the Syrian people were going to decide their leadership. Apparently now it seems they don’t have that option. So it seems that we’re hearing a lot of contradictory statements from the White House and it is hard to know what to make of it,” she said. “As you well know, we have a record number of NATO troops massed on the border with Russia - in Poland and the Baltic States. This is consistent with the tensions that have been rising since last week after this chemical incident in Syria and then the bombing of the Syrian airfield. I’m just hoping that dialogue, cool heads, and adult supervision will prevail here,” she added. “President Trump is inexperienced in the foreign policy area. He has not made the same effort he made in the economic sphere to appoint senior officials and advisors who would implement the policies that he spilled out consistently during his election campaign. Instead, he is letting himself be swayed by establishment positions,” he told RT. Effectively, in Seiff’s view, Trump has made a U-turn on his NATO policy. Speaking on Wednesday Trump yet again raised the spending issue. “Fair burden-sharing has been my top priority since taking office. We have now turned a corner,” the president said. Seiff says that even if European countries do increase their NATO spending, it will make no difference in practical terms. “Secretary General Stoltenberg today in Washington – and he is a hawk in these issues – expressed confidence that the overall spending rates would be rising to 3.8 per cent for NATO. He said there are now $10 billion more of defense spending in NATO. But when you look currently – only five NATO nations have reached the two per cent of GDP standard, which Stoltenberg has been pushing, and which Trump is now also pushing – last year in 2016. Stoltenberg says another two or three nations will reach this stage in the next year or two. This includes very small countries: Romania, which although is a large country geographically, has a very weak economic base; and Latvia, which is a very small country indeed,” he explained. He went on to say that in Germany and France powerful political forces are emerging who want neither increases in defense spending nor heightened tension with Russia. “This year we’re going to see elections in a couple of weeks in France – the first round of the presidential elections. And we’re going to see the German elections for the Federal government coming in the fall, in September. If those go against the hawks, then all of Trump’s hopes to have increased spending in NATO is going to go by the board. It is not going to happen,” he said. Trump's reassessment of NATO could also have an impact on the United States' relations with Russia, the analyst said. “The signs again in the short term are very pessimistic, unfortunately. NATO has been pushing under President Obama and under NATO Secretary General Stoltenberg to deploy increased numbers of forces in Eastern Europe allegedly to deter Russian aggression. This will only have the opposite effect. It is Russia that was invaded from Western Europe and devastated in WWI and WWII. It was the Russian people who suffered more than anyone else. This concern, these historic memories go deep in Russia. Even relatively small forward NATO deployments, especially in countries that have very anti-Russian popular traditions in them – small countries even like Latvia, or even larger countries like Poland – create great alarm in Russia,” he said. 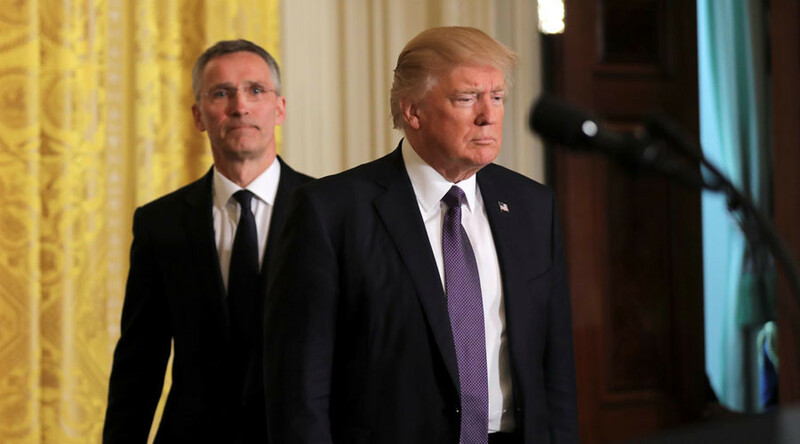 “So far from giving increased security to NATO and to its eastern members, these deployments that Stoltenberg wants, and Trump is going along with, will reduce security in Europe, and are much more likely to threaten the very catastrophes and breakdown of peace and security that they allegedly claim to prevent,” Seiff concluded.